Welcome to the ladies page. Here you will find current activities exclusive to the ladies at the club. Congratulations to Josie Cahill with her first hole in one on the 1st hole Sun 25th Nov.
Top Lady player of the year 2018 Trish Cox. Congratulations Ladies Cup 2018 Winner Joan Homan. Congratulations to Joan Homan & Maureen O'Neill Pearl Grogan Cup winners 2018. Congratulations to Bridget Murray on winning the George McDonnell Cup and this years Player of the year award. Well done to Marie Delaney on winning the Ladies Cup. 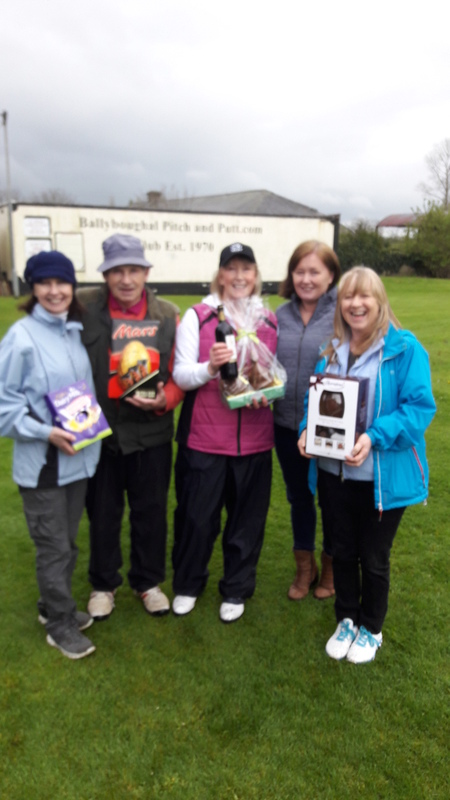 Congratulations to Team B, Bridget Murray, Marie Delaney & Ann Boylan winners of the Ladies League Pearl Grogan Cup. R/up Team E, Joan Homan,Pauline Gargan & Patricia O'Toole. For all club events please remember to check the Notice Board Page. Congratulations to Mary O'Sullivan with her first singles win Sunday 18th June. Well done to Trish Cox winner of the 4th Club Major of 2017 the Jack Fitzsimons Prize. Also nearest the pin on the day Patricia Delaney. Congratulations to Breda Finnegan on winning the George McDonnell Cup and on being crowned Player of the year for 2016.